Summer seems to have arrived in Middle Tennessee. As you know, I spend a lot of time sitting on my back porch as Charcoal sniffs all that needs to be sniffed. 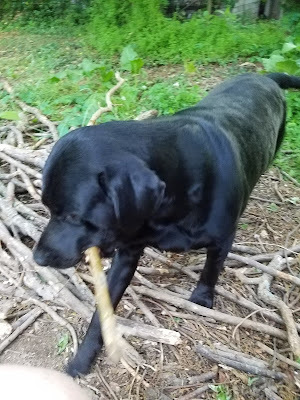 There are sticks to be moved! Most of the time I spend is in darkness, since I seem to keep my days/nights confused. 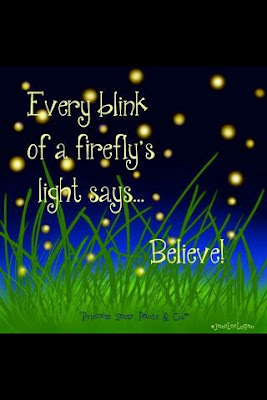 The other night I noticed that the Lightening Bugs~~yep, that is what we call them in this little corner of the world~~were starting to get plentiful. 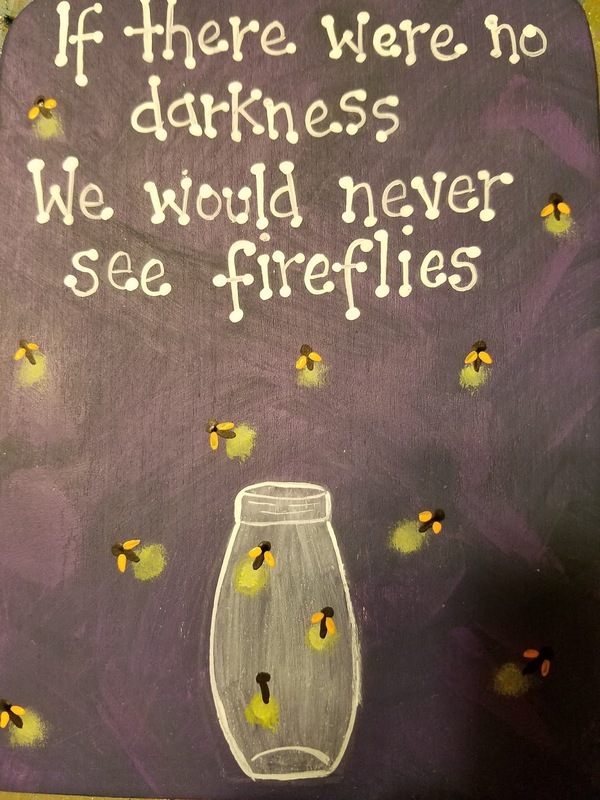 WHO hasn’t found a jar to gather lightening bugs on a hot summer night! 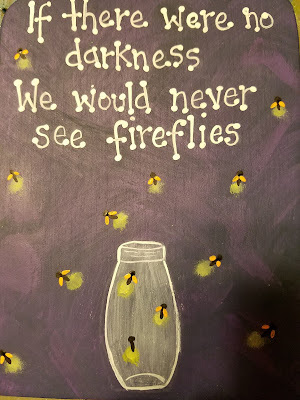 To honor this passage into summer, I thought I would share an easy way to paint lightening bugs…this would be a fun thing to do with the children/grandchildren. 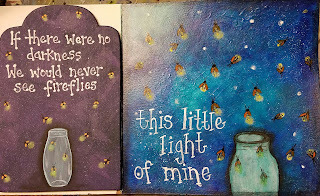 Wouldn’t it be fun to buy a Mixed Media notebook to keep of things you and your children/grandchildren painted this summer? What a keepsake it would be! Think how you might encourage them (and you) to CREATE!! 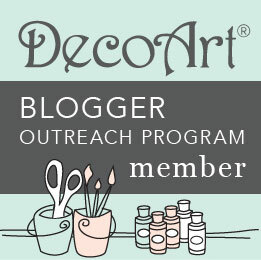 To start, I grabbed, what else, but My DecoArt Products. 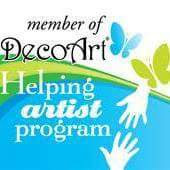 I am proud to be a Helping Artist with DecoArt. 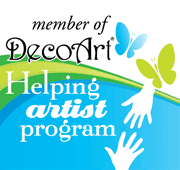 I have bought most of the products at a discount from DecoArt, and a few of the paints have been given to me to create with; however, I have used DecoArt products for over 20 years, and find them to be the best! 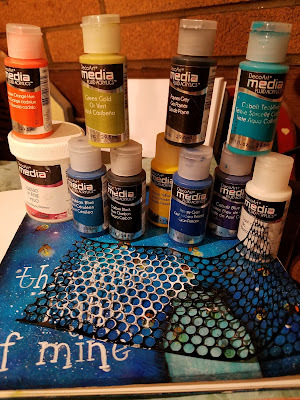 I grabbed some blues and got started. I start with a lighter color in the middle, so I used Cobolt Teal Hue. 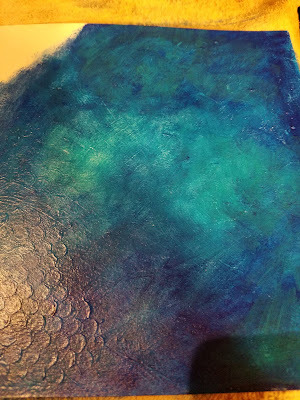 I worked in some Primary Cyan, Cerulean Blue and Cobalt Blue. There is no right or wrong…it is just doing what you like. 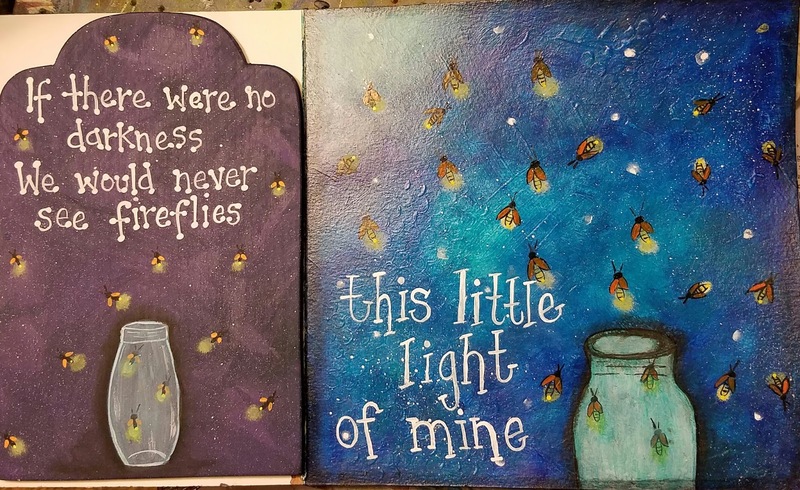 My Goal was to have the edges darker and I wanted a LIGHT SOURCE in the top left corner, so I didn’t put any of the blues there. I kept layering the colors until they were blended. For that lighter area in the corner, I added Titanium White and then some Primary Yellow and more white and then worked some blue into the white…again, the goal was to NOT leave any distinction of my colors…I wanted the colors to blend flawlessly together. 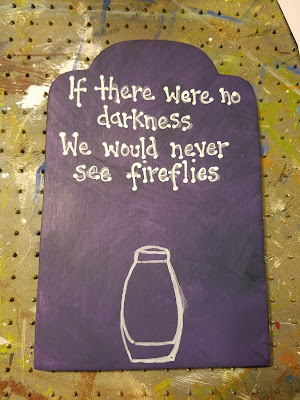 For the jar, I used thinned Titanium White to paint the jar. Don’t worry about the shape, because jars come in all shapes and sizes. To make the lightening bugs, I started out by dry brushing Titanium White in several spots. Dry Brushing means that you use a dry brush and VERY little paint and gently scrub it onto the surface. When this dried, I dry brushed Green Gold. The bugs were painted with Carbon Black and a liner. Make a dot for the head, two antennae, two wings, and the body and lines on the body. 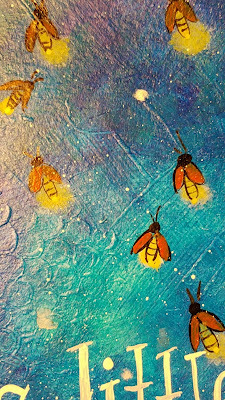 Paint the area inside the wings with Cadmium Orange Hue and the body with Green Gold. You might need to go over the lines again if your paint wasn’t thin enough. Add a dot of Primary Yellow to the tails. Thin Cobalt Teal Hue and brush it over the jar. For the lettering, I used a chalk pen (they are made to write on chalkboards) to free hand the lettering. I went over it with my liner brush and Titanium White. When the lettering was completely dry (be careful), take a wet brush to remove the chalk lines and dab it with a lent-free cloth. 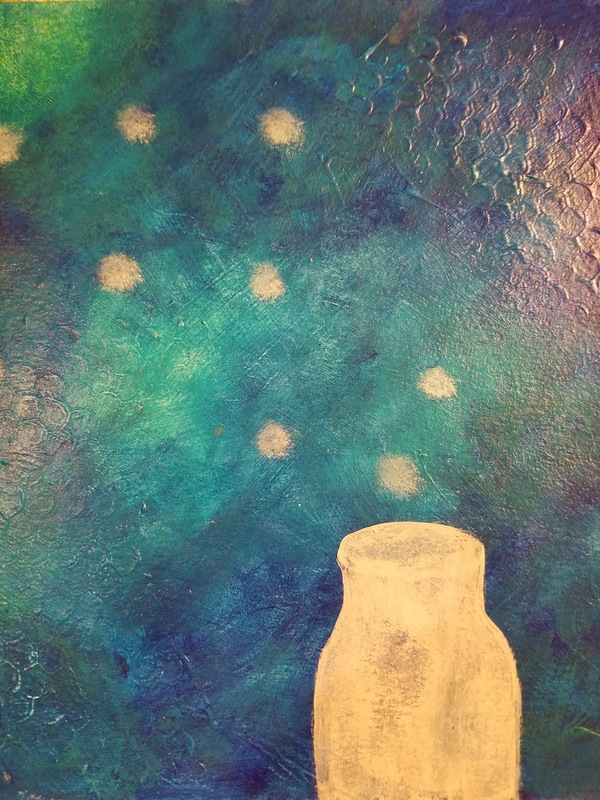 To make the bigger stars, I added a drop of water, and touched a blob of Titanium White into the drop of water…leave it alone and it will spread out a bit to look like stars that have a halo around them. 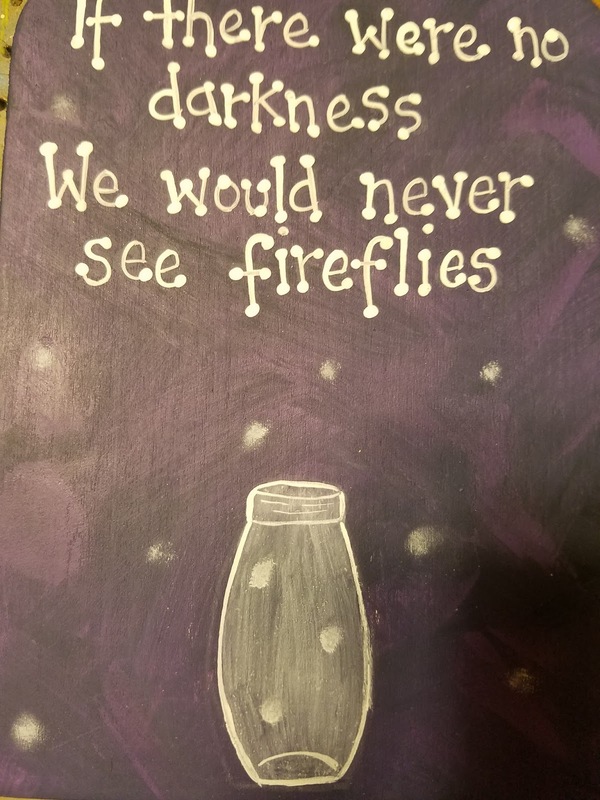 With a toothbrush, I splattered Titanium White to make it look like stars. With a fude ball pen (my first time using it), I outlined the jar and smeared it for shadows~~fun stuff. 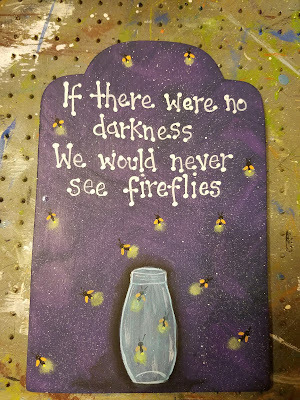 And lest I forget those TRADITIONAL Painters, I made another sign using DecoArt Americana Acrylics…This is HOME to me! 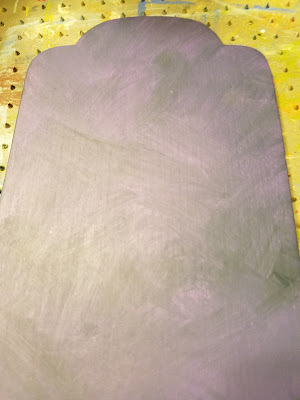 Base the surface with one coat of Grape Juice and let it dry. Place two small puddles of Grape Juice and Deep Midnight Blue on the Pallet. Pick up some of each color and slip-slap it onto the surface. 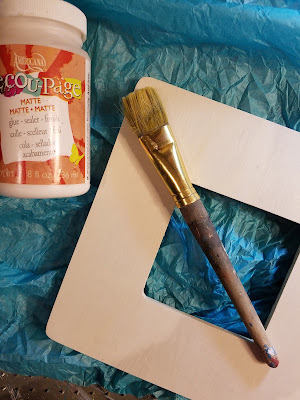 To do this, I make an X with the paint until I have the surface colored. Do not over work your paint, or you will get just ONE color. You want some of each color showing. 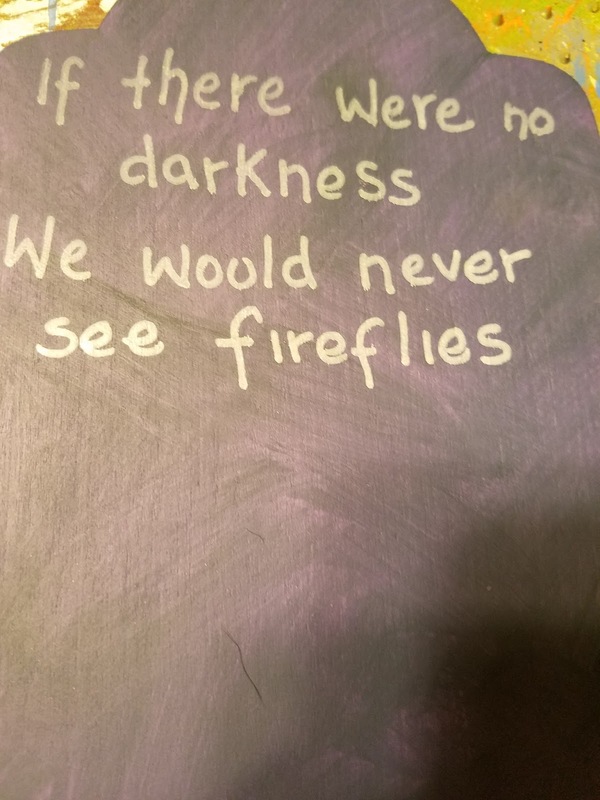 With the chalkboard pen, write your saying. Using this as a guide, go over this with your liner brush and Titanium White. Add dots to the end of each letter~~this is what makes your piece whimsical. 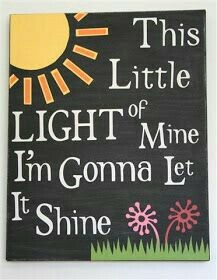 I have seen too many pieces that could have been cuter, if ONLY dots had been added to lettering! 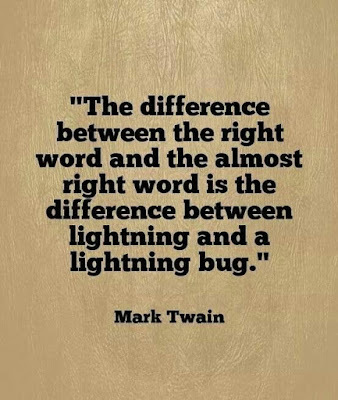 It is those tiny details that will set your work apart. Outline the jar with the liner brush and Titanium White. NOTE: You may use a toothpick to do line work if you don’t have a liner brush. This is sometimes easier for children. When the letters and dots are completely dry, use a wet brush and a lint-free cloth to remove the chalk…BE VERY careful with those dots. They take longer to dry than you think! Thin Titanium White and paint the jar. 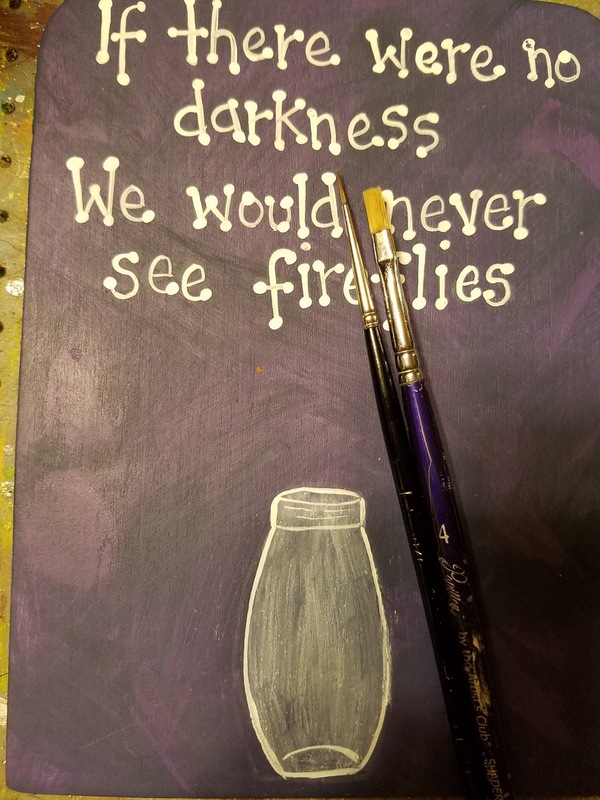 With Titanium White, dry brush Titanium White where you want lightening Bugs. 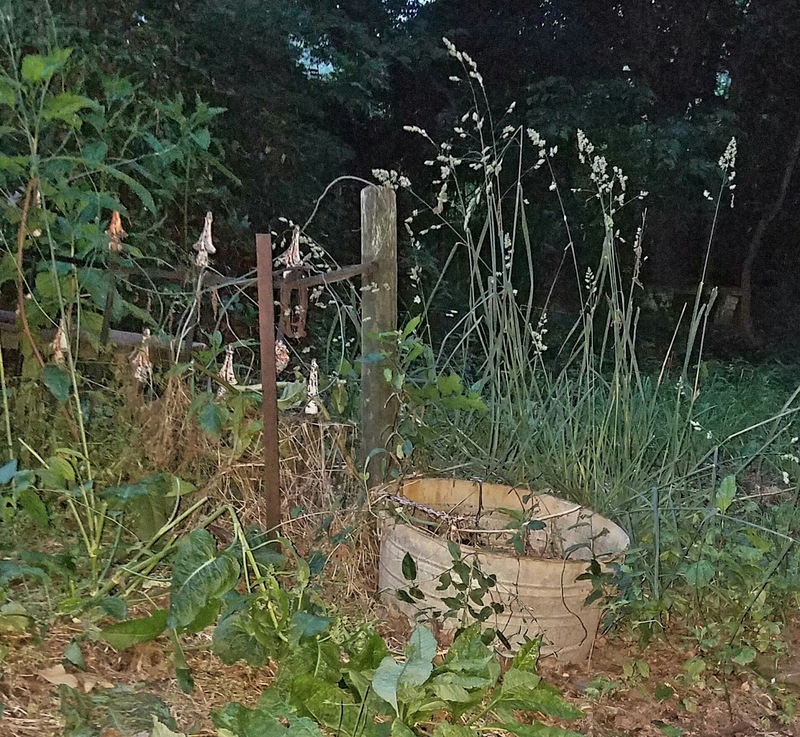 When dry, go over these with Citron Green…it is fine to go past the white dots. 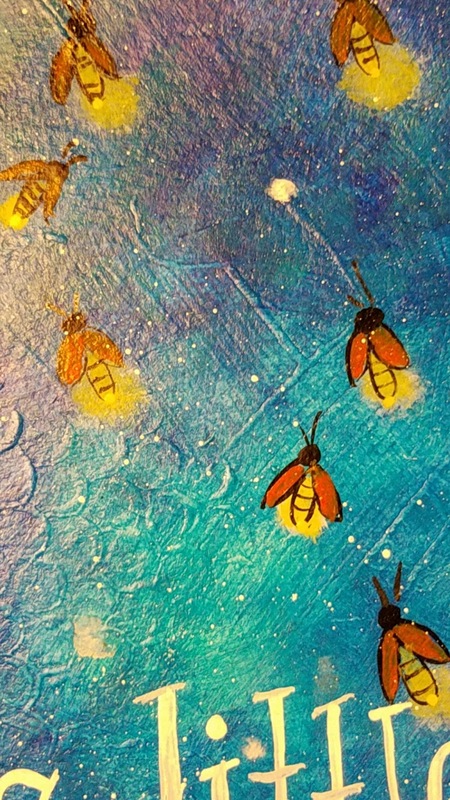 With the liner and Lamp Black, add a dot for the head, a longer line for the body and 2 antennae. The wings are Tangerine added with the liner brush. Load the brush and simply set it down on the body for the wings. 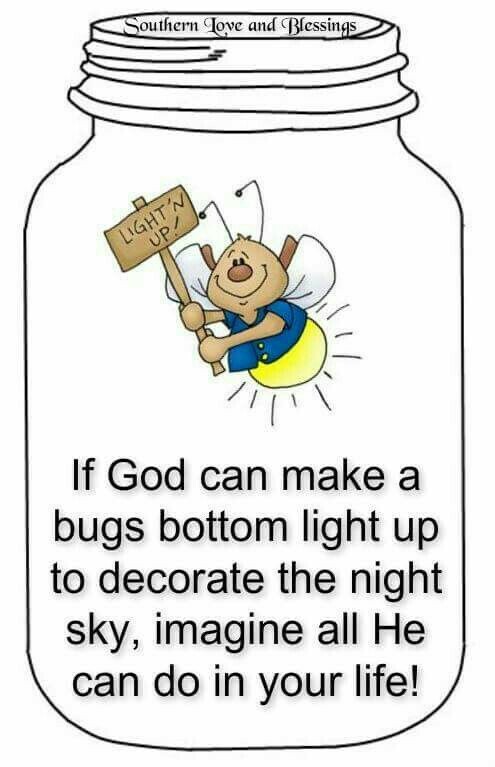 Add a dot of Sunny Day to the end of each bug. 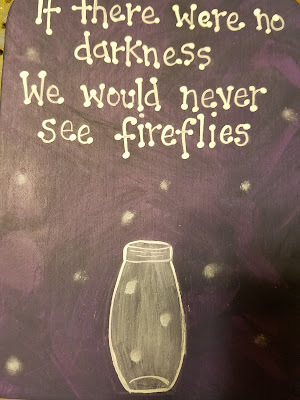 IF you know how to float, then float Lamp Black around the jar. If you don’t know how to float, take a brush and add water around the jar…not too much…just until it is shiny. 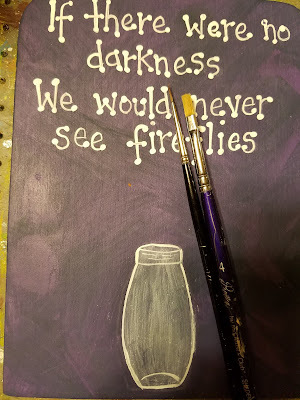 Take a flat brush if you have it (you can use a round brush if you don’t have a flat brush) and run one corner through your Lamp Black Paint ~~not too much paint. Keep that edge next to the jar. The water will make the paint bleed out a little, making a shadow. 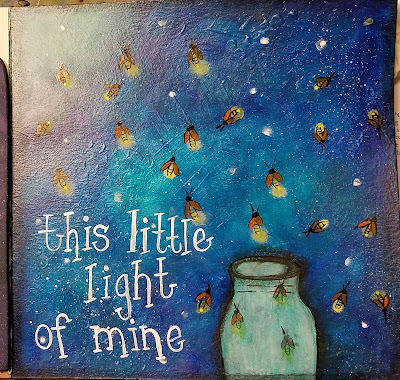 Thin Turquoise Blue and paint it over your jar to make it blue. Add just a few messy streaks with Titanium White to make it look like a reflection…The shading and the highlights are what gives your painting dimension. 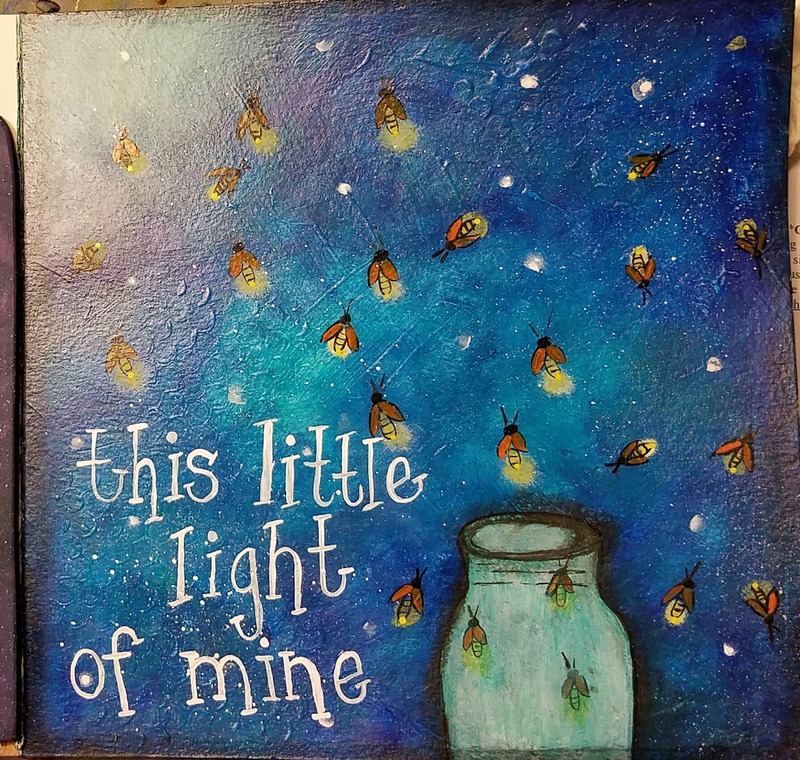 I hope you all with add a touch of WHIMSY to your paintings with a lightening bug!! If you do, share it with me! What a fun post Charlotte! We call them lightning bugs too!!! 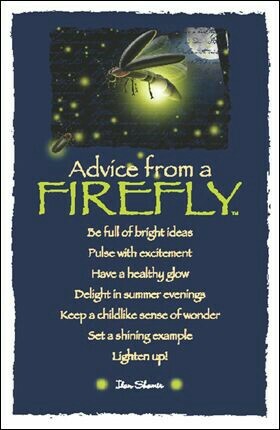 I have great memories of collecting them in a jar when I was a kid and watching children/grandchildren do the same. 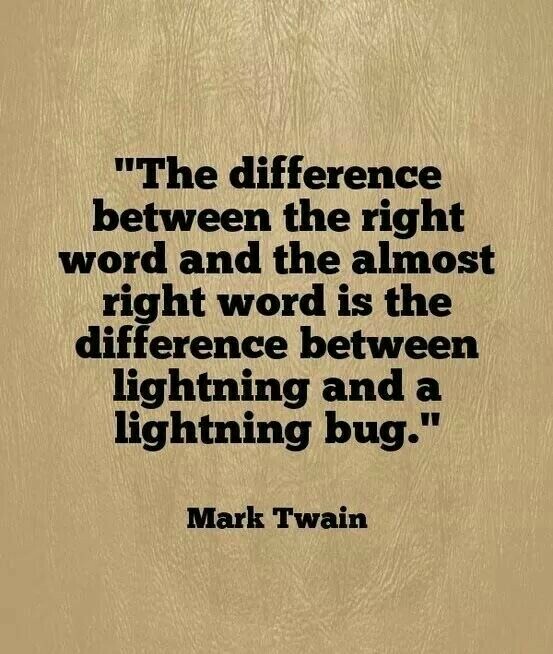 Hubby and I both cackled at your bugs bottom statement - GREAT point! Both of your projects are wonderful. Thanks bunches for a delightful visit with you. Xj. 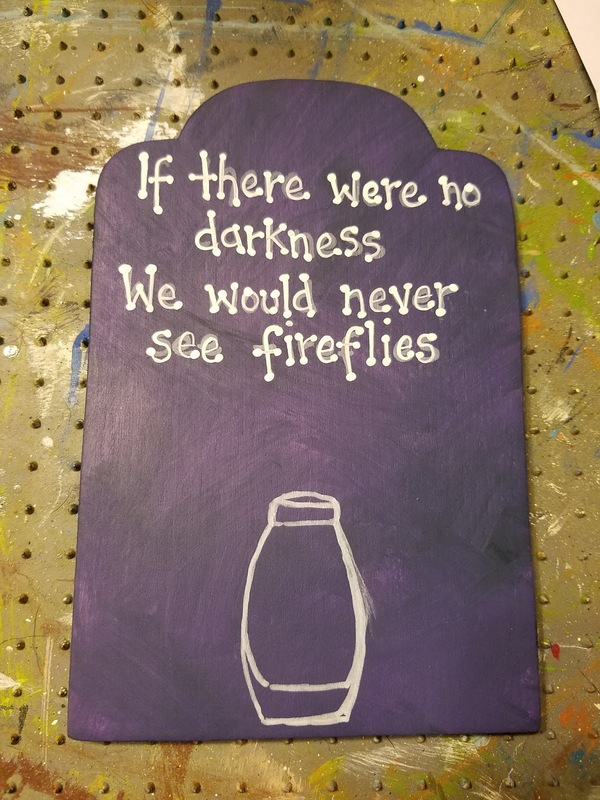 Fun projects! 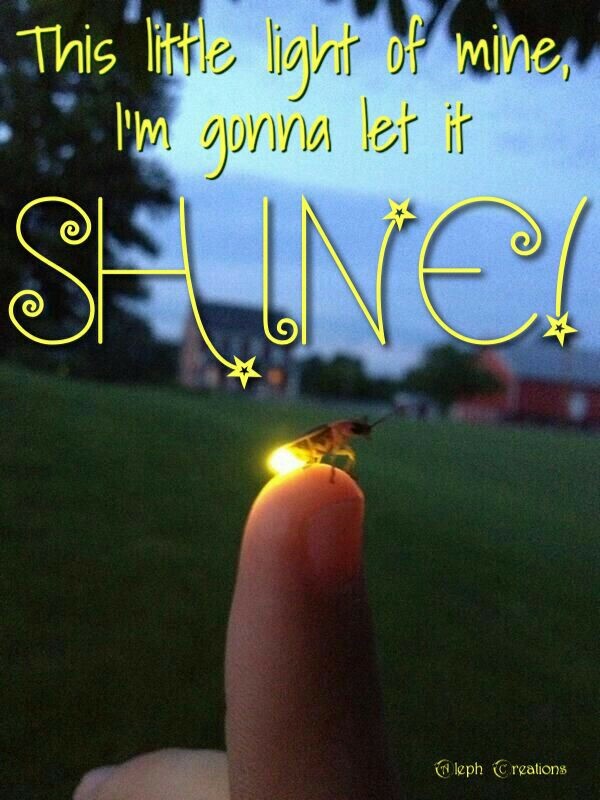 And they are lightening bugs in central Illinois, too. 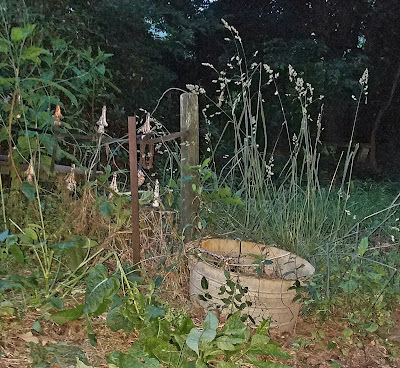 The other night when i took Jake out, the front yard was a-glow with a LOT of lightening bugs. It was awesome! Love lightening bugs and love this post! These are so cute. 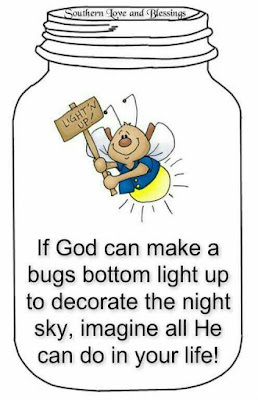 Can't wait to try a lightening bug or two myself! They just say "country" to me and you know I'm a country girl at heart!